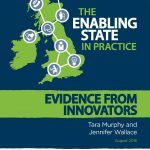 Our new report introduces the learning from 6 innovative projects which show the current ‘state of play’ of the Enabling State. The projects were the winners of our Enabling State Challenge. The overall picture gathered supports that the Enabling State approach is gathering momentum, due to a combination of reduced budgets and a desire to work differently to improve people’s lives. However we continue to see two models running in parallel, with innovations coming up against challenges of rules and regulations designed for a more traditional model of public services.